Thursday is D-Day. For seven bids, their hopes of hosting either the 2018 or 2022 World Cup will be gone. However, for two select bids, years of hard work will have paid off. As I've said in the title, my feeling is that the Spain/Portugal bid will win the 2018 FIFA World Cup, with Qatar winning the 2022 World Cup. On 10 am Thursday, we'll see if I'm right. When it comes to the 2018 World Cup, it could honestly be the tightest of three horse races this process has ever seen. There is only one bid that I think is dead on arrival: the joint bid from Belgium and Holland. While it would be nice to see Holland one day host a World Cup, trying to negotiate lesser demands from FIFA has finished off this bid. I think when the voting comes, Belgium and Holland are the first to go. The Spain/Portugal bid has one thing going for them- momentum. It certainly helps to have Spain be the current World Cup champions. It also helps they have done nothing to create massive waves in the manner the media has in almost hijacked the England bid, and the Russian Prime Minister has taken away from Russia's bid. This joint bid has flown under the radar, mainly because the majority of the people didn't think joint bids had a snowballs chance in hell. However, since Sepp Blatter has done nothing to quell joint bids this go around (as he did during the 2010 bidding process), the other nations made a serious error in judgment. The kicker for me with regards to Spain and Portugal's bid is they have the right mix of old and new. They have the classic stadiums in the Camp Nou and the Santiago Bernabeu. They also have the stadiums built in Portugal for Euro 2004. With new stadiums to be built in Bilbao, Malaga, and Santander, it will help further the infrastructure for the game in Spain. It also would unite the entire Iberian Peninsula. It's not often you will ever see anyone say that. 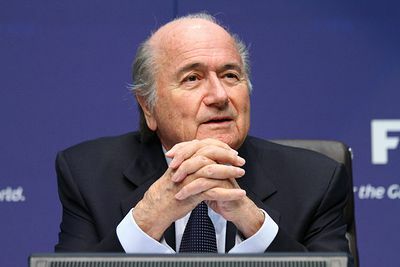 This one is all about one thing: Sepp Blatter's legacy. Sepp Blatter was immensely proud to see the World Cup hosted on the African continent this year. He would also love to see another first time host before he leaves as the head of FIFA. That would leave two choices- Qatar and Australia. Make no mistake about it, the United States is a serious player in this bid. For sheer stadium size and profit from those stadiums alone, they will make it to the last round of bidding. However, I just don't think the United States will win the 2022 World Cup. I think though the United States will end up with the 2026 World Cup. Qatar presents many unique challenges for FIFA. It would be the first time the World Cup would be hosted in the Middle East, something that Sepp would love to say he was the first to do. In Qatar's presentation Wednesday, they were quick to present a front to help unite the Middle East. While history would be quick to say that's nigh impossible, I think Qatar's the safest nation in that region to help unite everyone. It would also be the first time a World Cup would be staged in such a centralized region. With five of the seven host cities within a twenty-five kilometer radius of Doha, and all seven within 100 kilometers, it would present a challenge for the current logistics. However, with the amount of money the government has promised for both stadiums and upgrades to current infrastructure, I don't think this will cause a problem come 2022. The coolest thing about this World Cup bid is the technology involved in keeping the fan zones and stadiums at a reasonable temperature. With the temperatures in Qatar hovering around the triple digits for most summer days and not getting below 85 degrees Fahrenheit in the evening, this technology is key for providing safety for players, officials, and fan alike in official FIFA areas. Qatar is convinced the technology will work, and by using solar power to keep these areas cool, they promise a carbon neutral World Cup. The promise of that carbon neutral World Cup also helps the bid. I do feel for South Korea and Japan's bid. South Korea's bid pretty much died with the present uncertainty surrounding the nation politically. During Japan's bid presentation, I couldn't help but feel it was nothing more than an advertisement for Sony. Make no mistake about it, FIFA will find use for the 3D technology promised by Sony in Japan's bid. It's just a pity Japan won't be the host when that technology comes into play. As for Australia, I think the infighting between the various football codes in the nation is the thing that ultimately ends their hopes. While they came to an agreement now, there's no guarantee they are able to keep that agreement come 2022. I want to make one thing perfectly clear: as an American, I would love to see the FIFA World Cup come back to the United States. I will be among the first to celebrate should they win the right to host. As I said above, I think the USA is all but a lock for the 2026 World Cup. The only thing that would stop that is if China says they want the World Cup. If that's the case, it could be 2034 before the United States has a shot at the World Cup.